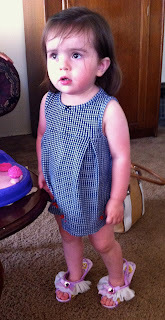 Martha's Favorites: I AM LATE TO A VERY IMPORTANT DATE! TEA CUP TUESDAY! I AM LATE TO A VERY IMPORTANT DATE! TEA CUP TUESDAY! Hello Ladies and welcome to Terri and Martha's Tea Cup Tuesday No. 165! Sorry I am running a bit late today, I have had a busy week with the grandchildren and as you know, everything always stops when they are in the house! 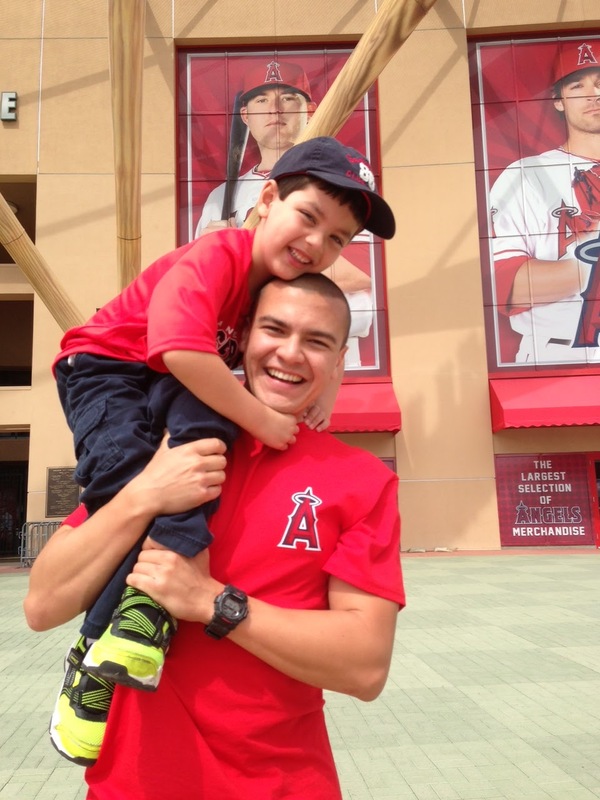 Noah went to his first Angel Game with his favorite uncle, while Sophia had her life changed with a new pair of shoes. She loves walking around with these heels. 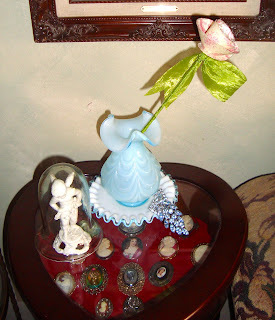 I have to show you the wonderful giveaway I won from Ruthie Miller. For some reason, I cannot seem to get back on her site to let her know I got them. It is a wonderful buffet of all things tea. One of the most fun prizes I have ever seen offered and I won it. Thank you so much, Ruth, please let me know how to reach you. I threw away the box and I just want to say thank you so much. I just love every piece. Did I ever tell you I collect Lefton? It is one of my favorite china. I am aware they are not of the highest quality, but the pieces are so cute. I have so much of Lefton, just because of the whimsey look they have. This first cup is one of my favorite. I know I have shown this one to you a couple of times before, but it is worth seeing again. It is completely hand painted with a pedestal shape cup. It is breathe taking. The next tea cup I want to share is a Royal Standard from England. It is a lovely Chintz cup with dark pink flowers. It has a great ruffle shape cup. Lovely! The very last cup is a very old BCM from England. Look at how full the design is. This Chintz cup is brilliant. It is my favorite Chintz cup. Very few companies can match the total detail that this cup has. I am late also, changing my house over for May! I still have the teal up. It seems the older we get the faster time goes by. Don't you find that true or is it just me? Anyway, here is Mr. Linky for this week. Terri has a lovely tea cup to share with us. As for me, I have a lot of parties to visit. So glad to see your post. Your granddaughter looked fab in the fairy heels. I like how you have a theme for TT post every time. Hi Sweet Martha! Your tea cups always give me a big smile. I bought a tea cup from you a while back and I think of you each time I use it! Been sad thinking about the changes coming with blogging. Unsure how to navigate bloglovin. Someone always changing the way we have to do things! Sigh! le retard est excusé ! les petits enfants passent avant tout! Goodness Martha -- lots of *busy* around your house. 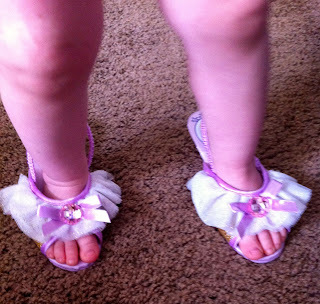 Your grand daughter is too cute in those shoes! Love the Lefton teacup (and the bling) and all the chintz. Happy Tea Day! Oh, it's so true, Martha. The days, weeks and months just fly by! What a darling Sophia is in her magic slippers! Getting so big. And Noah is a little man already. HOW did that happen? He was just born yesterday! I just love the Lefton teacup and the Chintz teacups. They are absolutely gorgeous! You have such a huge and beautiful collection! Thank you for commenting on my blogspot. I am a teacher and since my computer crashed I have limited time to reply and comment. Thanks for inspiring me! Your tea cups today are lovely. I think this Lefton cup of yours is the prettiest I have seen yet! I am glad you shared it again. I just love the roses inside it. Do you ever drink from it? I hope you are having a full and fun week. Hi Martha! More fun with the grands- hurrah- Angel baseball! Love the BCM cup, so pretty! Time with grandchildren is always important - can't wait! But, I know what my daughter is planning to do and support her. She wants to work a few years then be able to be home with her children. I love the photo of Sophia's chubby bubby legs, just gorgeous. Time with the grandchildren is always precious. I also love the Lefton tea cup, but then I am partial to a bit of bling, and that has it.